House and time at Malvern: No 1, 1901 - 1905. Died: 22 October 1914 aged 27 in Belgium. Killed in action near Armentieres. Born 6th November 1887. 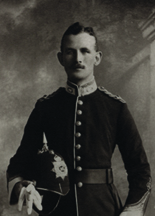 Son of Lt.-Col. Sir David Prain, C.M.G., C.I.E. (Director of Royal Botanic Gardens in Kew), and Lady Prain, of The Well Farm, Warlingham, Surrey. Upper V—VI. Senior Scholar. Faber Exhibitioner. House Prefect. University of St. Andrews; B.A. 1908; Lincoln College, Oxford; B.A. 1910; Oxford University O.T.C. Leicestershire Regt. 1910; Lieutenant 1912. Great War (overseas). "C" Coy. 1st Bn. Leicestershire Regiment. Despatches. Qualified as a 1st Class Interpreter in French. Died at Rue de Bois near Armentieres. '21st October 1914. Ordered to relieve W. Yorks in Chemical Factory - Rue De Bois line at 8pm.